Materials used: Tim Holtz, K & Company, Jenni Bowlin Stud﻿ios, Kaiser, Making Memories, Darkroom Door, Stampin'Up! (rubber stamp), Sizzix Die (felt flower), antique trim and button. I used Helmar 450 Quick Dry on this project. All of the embellishments are glued on the chipboard piece, that can be removed, to preserve the book cover. To make the flowers~ I cut them out using the Big Shot and the flower die by Sizzix. I punched out a 1/4" circle and adhered the Helmar Quick Dry 450 to that, then rolled up the felt flower and added it the cardstock circle to the back~works great keeping the flower together while the glue is drying (which isn't long at all) and then you have a base to glue the flower down to the project. 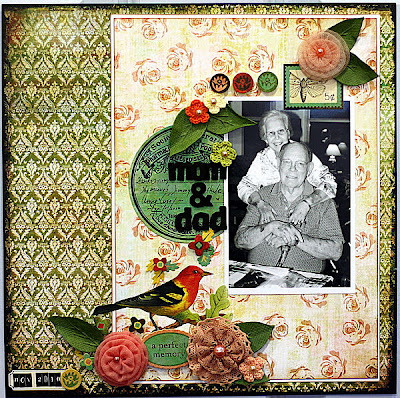 Materials used: Jenni Bowlin Studios Making Memories, American Crafts, Bazzill Basics, Bazzill, Basic Grey/Curio, Kaiser, Prima, Ying ( Esty Shop). I used Helmar 450 Quick Dry, Helmar Scrap Dots and Helmar professional Acid Free Glue on this layout. I used the Helmar Scrap Dots on the small round sticker pieces. The large Prima flowers were adhered using the Helmar 450 Quick Dry and the sticker piece at the top I used the Helmar Acid Free Glue. The sticker at the top had sticky on it but because it was touching the photo I used the acid free to glue it on. Playing it safe! 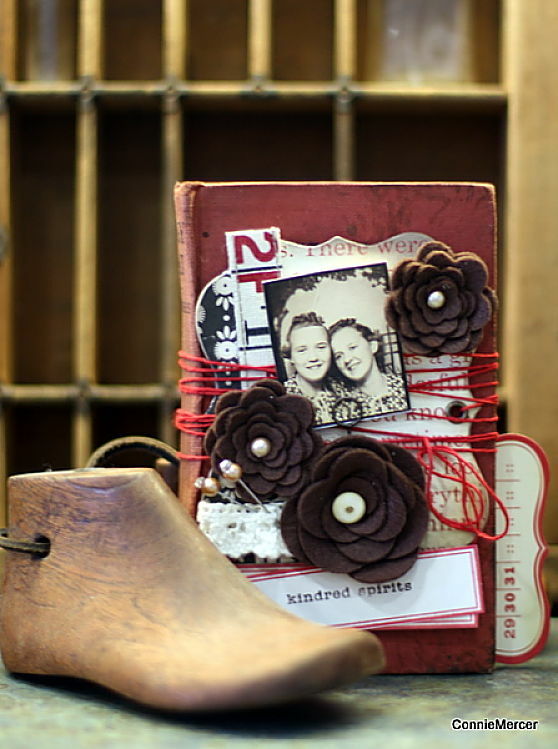 Materials Used: Prima, Jenni Bowlin Studios, Basic Grey, Maya Road, Kaiser, American Crafts, 7gypsies and antique trim/ribbon. I used the Helmar 450 Quick Dry, Helmar Professional Acid Free on this printers tray. All of the flowers and embellishments on the outside of the printers tray were attached using Helmar 450 Quick Dry. I used Helmars Professional Acid Free Glue on the paper and photos. The Helmar 450 Quick Dry Adhesive is so fast attaching you are able to keep working ~no waiting to dry! These are the three Helmar products I have and they have replaced my hot glue gun ~ no more burned finger tips !!! Thank you , Helmar!!!! Not only should you make it to guest designer, but you should be on the Design Team. How cool is this! STUNNING!!! WOW!!! all the projects are absolutely yummy!!!!! you so rocked it! Such gorgeous projects Connie! I adore that first one especially!!! beautiful projects Connie, best of luck with guest designing! These are truly amazing! 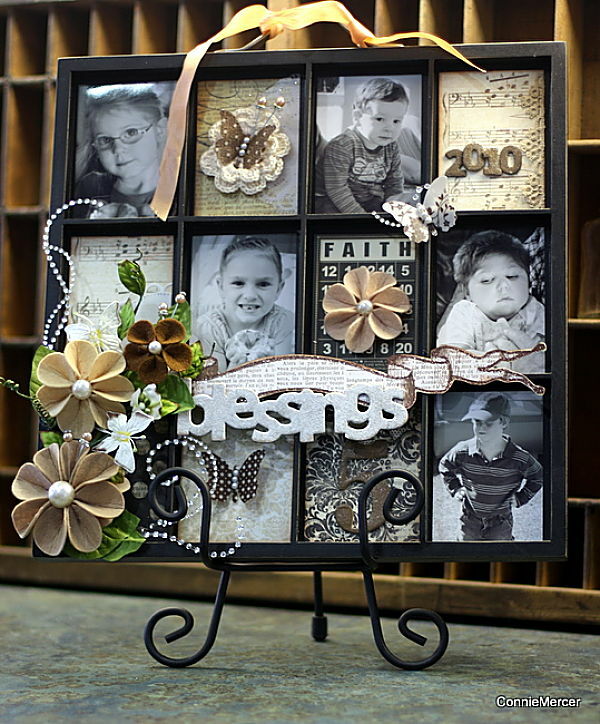 My favorite is that wonderful photo frame with some really cute photos in it. Oh my goodness! There is not enough room here in this little space to put all the good comments about what I saw! I agre with Debby YOU should be the whole design team! Beautiful, awesome, fantastic work. Your artistry is amazing! your projects are awesome !! I hope you will be picked !! Love all of these designs..really want to do a painter's tray of Ryan's wedding photos. I THINK I can do it, if I borrow some of your amazing ideas!!! I just love your projects! I have such a hard time with Shabby Chic and you designed it perfectly! I love the Mom & Dad layout!! So sweet. Oh, and the printers tray is just beautiful! Gorgeous Connie! The first one is my fave, I just love it. So arty and lovely! wow, connie! gorgeous! gorgeous! you got my vote and Tracy and team are so generous. good luck!!!! !